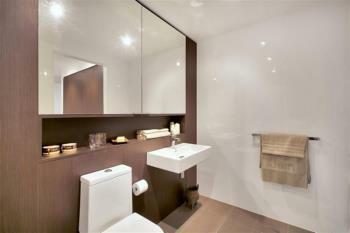 Biggest one bedroom furnished apartment in a Marcahese architect designed building. Boasting a very convenient location offering easy access to the multitude of cafes, restaurants and shops of Gladesville. Gladesville Public School, Glade Bay Park and buses to the city are within easy strolling distance. There is a wonderful rooftop entertaining area with barbecues and stunning views of the City and Parramatta River to the Blue Mountains. - One Bedroom with built in wardrobes. - Galley style kitchen with gas cooktop and dishwasher. - Open plan living and dining. - Security building with lift access and video intercom.